I am very blessed to have two very creative and talented sister-in-laws. One of them has recently started to blog here. 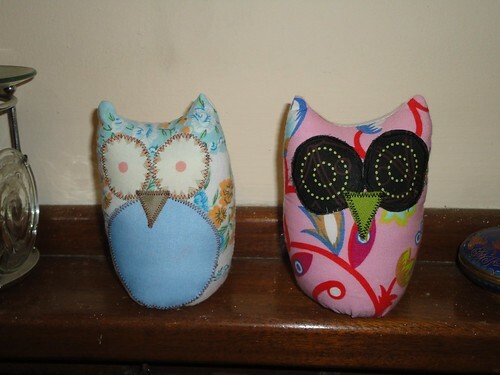 A few weeks ago I saw some gorgeous little owls on her blog and proposed a swap. Before I knew it these wonders appeared in my mail box. Aren’t they wonderful? They are made from upcycled vintage fabric. When I opened the package Gorgeous Girl’s first words were: “Aunty Shell is very clever!” She then spent the afternoon playing with her owl (the pink one) and took it to bed with her. Rochelle, we love the owls! I was delayed with my part of the swap by illness. I got over the throat thing only to come down with the flu. So pictures of what I’m sending in return when they have been received. I’ve finally finished the finishing touches and will get them in the post tomorrow. If you would like a similar owls to come and live with you (they are all one of a kind) you can visit Rochelle’s Etsy shop. I’m finally feeling back to normal and more like my old self. Though I’m still finding it hard to get around all the blogs I like to read and answer my email. 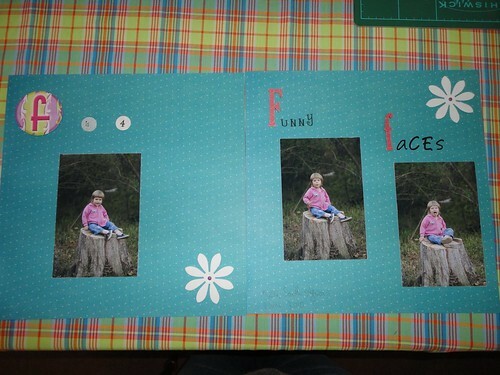 A sign that things are heading back to normal is that I managed a scrapbook layout on the weekend. My friend Kerin sent me a sheet of these alphabet circles and I’m slowly working through them. When I’m done I’ll have a page for each letter of the alphabet that I’ll put into one album. I wish I was better at adding stuff to the page, but it is what it is. I would have done more pages, but Gorgeous Girl woke up from her nap and wanted to scrapbook, it was difficult enough to finish this one after that let alone start more. I also finished a charity hat. 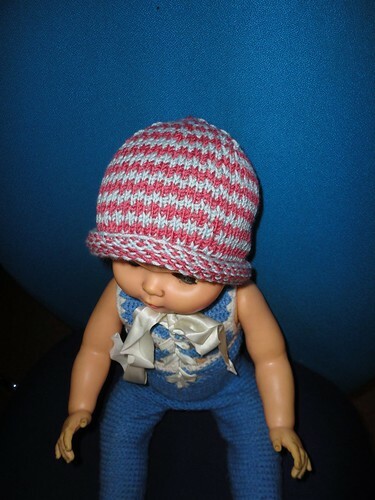 This is a simple slip-stitch hat. I worked out the slip stitch sequence myself, though there is nothing really new when it comes to knitting and I’m sure it has a name. I have also finally finished the jumper (sweater) for Gorgeous Man. Based on my Ravelry notes I started it 15 August 2010, so it’s been a long time coming. It’s been worn quite a bit since it came off the needles, but we haven’t had a chance to do photos just yet.